Add style to your home with the Brasstown Oak 8 mm x 8-1/8 in. x 47-5/8 in. Laminate Flooring. A medium-color gunstock oak finish and embossed surface offer a real hardwood look and complement a variety of home furnishings for a sophisticated appearance. A tap-lock joint system helps make installation quick and easy. These planks are compatible with select radiant heating systems for additional comfort. 21.36 sq. ft. per case. Case quantity: 8. Case weight: 30.52 lb. Buy online Hampton Bay Brasstown Oak 8 mm Thick x 8-1/8 in. Wide x 47-5/8 in. 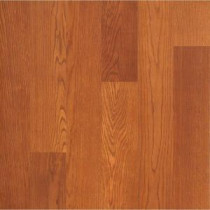 Length Laminate Flooring (21.36 sq. ft. / case) 367491-00194, leave review and share Your friends.